Are you a grad student, junior or senior in Geography, Meteorology, Hydrology or related field? Flood Control District of Maricopa County has an exciting paid internship opportunity. Applications close on Monday, July 3, so hurry and apply! The World Meteorological Organization Rapporteur of Climate and Weather Extremes (Dr. Randy Cerveny of ASU SGSUP) has just verified the longest horizontal lightning strike ever recorded: 199.5 miles in length. Astounding, and 10 times longer than we had thought (we’ve had evidence of lightning striking victims as far as 10 miles from a storm, and it was assumed lightning wouldn’t travel more than 20 miles). Oh, and the committee also verified the longest lasting strike: 7.74 seconds. The September equinox is coming! An equinox is when the sun’s most direct rays strike the equator, and this next event will occur on Thursday, September 22 at precisely 1421UTC (7:21AM in AZ). Remember that season names (like Fall and Spring) are hemispheric-based. In the Northern Hemisphere, we’re heading into Fall; in the Southern Hemisphere, they’re heading into Spring. Enjoy! A 12-year-old boy just died from heat after he collapsed on the Sidewinder Trail near 19th Avenue and Dove Valley in north Phoenix. Last week, a 17-year-old boy died after being struck by lightning near the top of Mt. Humphreys and three semi-trucks crashed on I-8 as a dust storm limited visibility. Arizona is lucky that we haven’t had any flood fatalities yet this summer (although last September we lost 20 people to flash floods near the Utah-Arizona border). Collectively, these are the top four deadliest weather events in Arizona. Which is deadliest? Lightning kills the fewest (average about 2 fatalities every year), next, dust storms (about 3 fatalities per year), floods (about 4 fatalities per year), and then heat (average 118 fatalities per year, and according to the AZ Department of Health Services, nearly 2000 people are treated at emergency rooms every year for heat-related illness). Heat kills not only on hiking trails (the City of Phoenix handles about 200 rescue calls annually), but heat also kills those outside for other reasons. A 12-year-old Georgia boy has brain damage from a heat stroke while practicing football last week. You may recall the tragic death of Vikings football player Korey Stringer in 2001. Are these tragic deaths preventable? What should we do as a community to lower these numbers? From my perspective, education plays an important role in understanding a weather situation (situational awareness) before the only options that remain are bad or worse. Our local National Weather Service office (Phoenix) is offering a great opportunity for meteorology undergraduates (junior/senior), graduate students, or recent grads (within 6 months). South Carolina is experiencing historical amounts of precipitation. There have been hundreds of swift-water rescues and several fatalities. Residents are under a boil-water notice because flood waters are not clean waters. The flood reaches into sewers, breaks water lines, and spills raw materials. Animal carcasses float in the water, as do live snakes and rats. When we talk about ‘1000-year’ precipitation events, it’s the same type of statistical relationship we have with flooding events. In other words, we have some measure of observations for a certain amount of time (period of record). We calculate the return interval (how often this amount of water tends to occur based on the observations). Then we extrapolate and extend that record to use as a tool for amounts that have never been observed in our period of record. The precipitation period of record for most US locations only extends back to the mid-1800s (for Phoenix, it’s 1895). How can we talk about 1000-year events? Because the statistical return interval tell us the relationship between what’s observed now and statistically how often that amount of water tends to occur. You can see the tables we use for precipitation here: NOAA Atlas 14. Typhoons, cyclones, and hurricanes combine to become the deadliest weather events globally, not only from their strong winds and tornadic possibilities, but primarily from inland flooding and storm surge. More than half of all tropical cyclone fatalities are caused by drowning, if not more. Tropical storm Etau made landfall last week in Japan, dumping more than 20 inches of rain in 24 hours. This caused not only flooding, but also landslides. When water hits a slope, it acts as a driving force for downslope movement. Bullet trains were stopped, and a levee in a local town was overtopped. Local residents had to be rescued from their roofs. The death toll stands at 7; all missing have reportedly been found. Meanwhile, the same moisture surge that gave us some precipitation yesterday brought a wall of water to the AZ-UT border. 8 are confirmed dead and 5 are still missing as an SUV and van carrying a total of 16 people were swept away in a flash flood. Here’s what a flash flood looks like in that area. Did you see all the debris? If you get caught in that, it’s likely you won’t survive. There’s much to unpack here, and it’s all about meteorology and geography. First, let’s take a look at the use of the term ‘haboob’. This term blew up in the media after the huge June 5, 2011 event. We even made the New York Times. History: this term has been used describe dust storms in general since at least the 1800s. In Arizona, the term went mainstream with the 1972 article, An American Monsoon. A haboob is a dust storm generated by the down drafts of a thunderstorm. Cold down drafts are more dense and move out ahead of the storm (outflow). If the outflow picks up dust, it becomes a haboob, a very specific type of dust storm. A Nor’easter is a specific type of storm, where the winds are blowing predominantly from the northeast (winds are named for the direction that they are coming from). Along the East Coast, a northeast wind means that the wind is coming from the ocean, bringing lots of moisture. When that moisture hits a cold air mass, it condenses, making some of the most extreme snowstorms on record. In fact, most extreme winter storms like Nor’easters are actually types of mid-latitude cyclones. So, with that logic, we can’t call our dust storms Sou’westers because that would mean that our dust storms would be coming from the southwest. Since our dust storms/haboobs are generated from storm outflow, they can come from any direction. A lot do come from storms over Tucson, but we get just as many from storms generated over Globe (east), Cave Creek (north), and Wickenburg (northwest). Finally, a monsoon is a seasonal reversal of the winds (the word ‘monsoon’ means season). A monsoon is NOT a thunderstorm! The most well-known and researched monsoon is the Indian Monsoon, where winds “reverse” to a more southerly (and moisture-laden) flow. There are monsoonal flows on every continent (except Antarctica). It’s possible that we could tap into a lot of tropical moisture this week (from Hurricane Linda in the Pacific), which could generate some more thunderstorms. We’re not done with the monsoon yet! Over 6 inches of rain hitting a dry desert brings water flowing in normally dry river channels. This caused a bridge to collapse along Interstate 10 this weekend, west of Blythe. Homes flooded, water lines broke, and debris and dirt blocked roadways in Wickenburg. The community is still trying to clean up the mess from the weekend storm. San Diego broke rainfall records. There was a horrible event in Ohio this weekend, where a family seeking shelter in their mobile home were washed away in floodwaters. Two children and their pregnant mom were killed. A warm atmosphere (like we have in the summer) has a greater capacity to hold more moisture, and that means the precipitation can become more extreme. If precipitation is greater than the ground’s ability to infiltrate the water, then you have runoff at the surface (flood!). Water contains energy (think of digging a hole in the ground with your garden hose). When that energy is concentrated on the banks of a channel or the pilings of a bridge, you get collapse if the banks oversteepen. Parts of the East Valley had an interesting event last night. There was a fast-moving pop-up storm that flung hail, dropped almost an inch of rain, and exploded a microburst down on the community. How do you confirm a microburst? We use wind records (direction and speed), damage surveys, and radar. You can often see a microburst on the velocity radar screen. 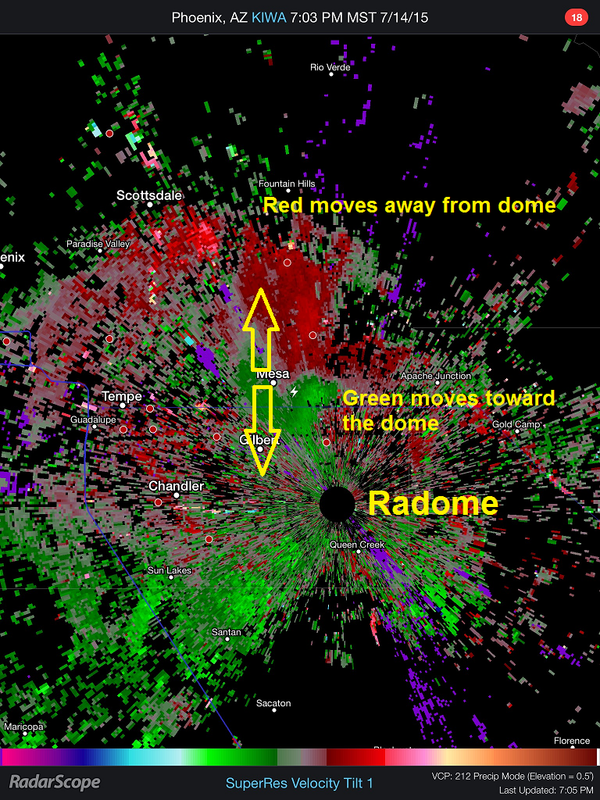 Red is wind moving away from the dome, and green is moving toward the dome. When you see a huge area with one side red and the other side green, that is usually signifying a microburst. (A microburst is a bomb of cold air that hits the surface and spreads out with straight-line winds from where it drops. Micro means that the event is smaller than 2.5 miles on a side. A macroburst is bigger than 2.5 miles on a side, and that’s probably what happened last night). What’s a pop-up storm? It’s not an ‘official’ weather term, but we use it to describe a storm that just sort of happened (i.e. it just appeared or popped up unexpectedly). The ‘official’ meteorological term is ‘pulse storm’. A pulse storm is just a single-cell storm, which means it is small is scale and doesn’t usually cause widespread damage. Summer means thunderstorms, which by definition means lightning. June, July, and August account for the majority (70%) of lighting fatalities in the US. Also, let’s just make sure that everyone understands how to spell the word. 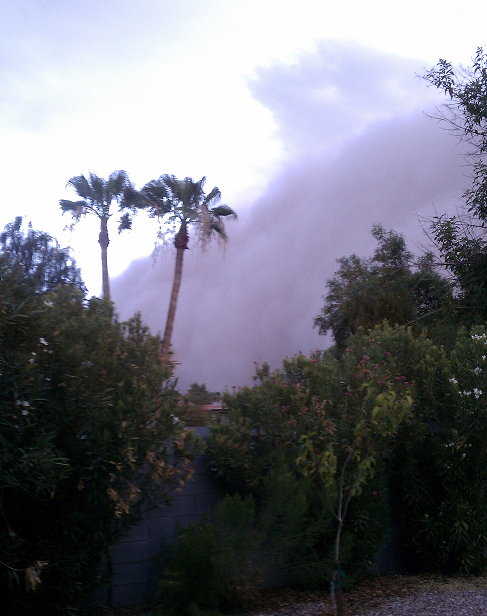 The AZ monsoon kicked in this year on Saturday, June 27, with a wallop of a duststorm (haboob alert!) racing through the Phoenix metropolitan region. Wind speeds were measured at 51 mph at Sky Harbor Airport, and an amazing 72 mph near Roosevelt Lake east of Phoenix. Our summer dust storms are typically the result of downdraft winds from thunderstorms that form initially in the mountainous regions north and east of Phoenix, or south near Tucson. One of these storms generated lightning that killed one and hurt several others hiking along the Mogollon Rim. Currently, there are 13 reported fatalities in the US, with a 30-year average of 49 fatalities per year. There are five common ways that people are struck by lightning, and they all involve being outside (although rarely inside your house). Along those lines, men (81% of lightning deaths from 2006-2013) are more likely to be struck by lightning than women. Want to know how they die? check out this article. So how can you prevent being struck by lightning? My answer is to never get yourself into that situation. Watch the weather reports, and always have a backup plan. Stay safe!